If he hadn’t been shot and killed outside his New York City apartment on December 8th, 1980, John Lennon would have been celebrating his 70th birthday today. 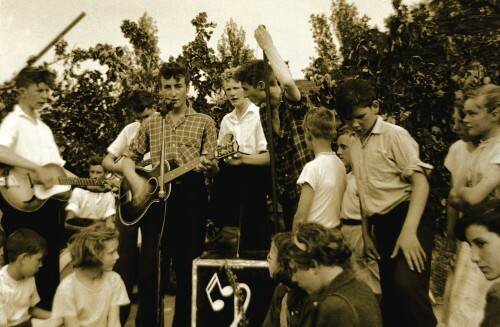 The day is being marked around the world with concerts and exhibits that include a bed-in and a photography exhibit that includes this iconic photograph, snapped on July 6th, 1957 on the day Paul McCartney met John Lennon in what’s considered to be the “Big Bang” moment that led to formation of The Beatles. Taken by one of Lennon’s schoolmates, the snapshot above is part of an exhibition that opened this week at the Paley Center for Media in New York City. The show is filled with early, rarely-seen images, including one taken by Paul McCartney’s brother, Mike. Courtesy Willy Wong/© NYC & Co.
As they do every year on his birthday and on the anniversary of his death, Lennon fans will also gather at Strawberry Fields, the memorial site within New York City’s Central Park. Tonight there will also be a free Central Park screening of LENNONYC, a new film by Michael Epstein with concert footage and home movies documenting Lennon’s life in New York City after the break-up of the Beatles. The film will air nationally on PBS as part of the American Masters series on November 22nd. The Rock and Roll Hall of Fame and Museum in Cleveland, Ohio is holding a John Lennon Weekend through Sunday that includes a concert, the sealing of a time capsule filled with Lennon’s music and items contributed by fans, as well as film highlights from both the Beatles’ and John Lennon’s inductions into the Hall of Fame. The weekend also features tours of the museum’s Beatles exhibit, which includes Lennon’s 1979 Yamaha Upright piano, his Sgt. Pepper outfit, one of his electric guitars and the 1964 Gibson J 160E acoustic guitar he and Yoko had with them for the two “bed-ins” for peace in March and May of 1969. Here’s a short video clip about that guitar by Rock and Roll Hall of Fame curatorial director Jim Henke. Fans can learn more about John Lennon’s political activism in Give Peace a Chance: John Lennon and Yoko Ono’s Bed-In for Peace, a traveling exhibit opening at the Lake County Discovery Museum in Wauconda, Ill. today. On display through January 2nd, 2011 will be more than 40 large-format photos taken during the bed-in for peace John and Yoko held at the Queen Elizabeth Hotel in Montreal from May 26th to June 2nd, 1969 and a re-creation of the room where the bed-in took place. In Los Angeles, the GRAMMY Museum has opened John Lennon, Songwriter, an exhibition that displays some of John Lennon’s guitars, his signature round, wire-framed eyeglasses, his typewriter, some of his original drawings and handwritten lyrics, and photographs, posters and other artifacts and memorabilia loaned to the museum by Yoko Ono. And in Liverpool, England is kicking off an event-filled John Lennon Tribute Season that will last through December 9th. In addition to rock, pop and classical music tributes, there will be art exhibitions, city tours, a poetry slam, lectures, an exhibition of early Beatles photos taken by Astrid Kirchherr (the girlfriend of Stuart Sutcliffe, the original Beatles’ bass player), and a Bed-In endorsed by Yoko Ono in which a curated group of participants will perform serious, humorous, commemorative or provocative actions in a publicly-sited bed over the course of 62 days.